The story of Cain who bore the mark on his forehead, has always bothered me. Someone may certainly kill his own brother in a quarrel, and he may panic afterwards and eat humble pie. But that he should be marked with a special “sign” for his cowardice that acts as a kind of protection and inspires fear in everybody else is strange indeed. What happened and lay behind the whole origin of the story was the “sign.” Here was a man who had something in his face that frightened other people. They did not dare lay hands on him; he impressed them, he and his children. It is virtually certain that he bore no actual mark on his brow like a birth mark; the mark was a little more intelligence and self-possession in his eyes than people were accustomed to. This man had power and they all went in awe of him; he had a “sign.” You can explain that how you will. People always want whatever is comfortable and puts them in the right. They were afraid of Cain’s children; they bore a sign. So the sign was not interpreted for what it really was but the contrary. They said that people with this sign were odd, as indeed they were. Men of courage and character always seem very sinister to the rest. It was a sinister thing that a breed of strange, fearless people should be going about, and so they attached a nickname and a myth to this family as a way of taking revenge and ridding themselves of guilt for all the fear they had experienced. Did Cain kill his brother? Yes, that is certainly true. The strong man slew the weak. But we may well doubt whether it was his brother. It isn’t important. Ultimately all men are brothers. Thus a strong man slew a work man. Perhaps it was the deed of a hero, perhaps not At all events the other weaklings were now filled with fear, complained bitterly and when they were asked, “Why do yo not slay him too?” they did not reply, “Because we are cowards,” but, “We cannot. He has a sign. god hath branded him.” The fraud must have originated somehow like that…But, I’m keeping you from your life. Goodbye then! And the Gods spoke and Brett Kavanaugh is elected to the Supreme Court, hero of the Fetus! We have all heard the story of Cain and Abel. Two brothers bring their sacrifices to God; Abel's sacrifice is accepted, but Cain's sacrifice is not. Out of jealousy, Cain take's his brother out into the field and kills him. Because of Cain's sin, he is branded with a mark and sent away. However, if we carefully study the text, we find that there is much, much more, to this story. Let's begin with their names. 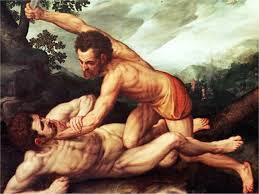 The names Cain and Abel come from the Greek Septuagint, a 2,000 year old Greek translation of the Hebrew Bible, where their names are written as "Kain" and "Abel." These names are the Greek transliterations of the Hebrew. In Hebrew, Cain is קין (qayin) and Abel is הבל (havel). The word קין (qayin, from the root QN) means to acquire or possess something which is why Eve (chavah in Hebrew) said "I have gotten/acquired (qanah, also from the root QN) a man" (Gen 4:1). The word הבל (havel) means to be empty, often translated as vain or vanity in the sense of being empty of substance. The Hebrew word for "name" is shem and literally means breath or character. 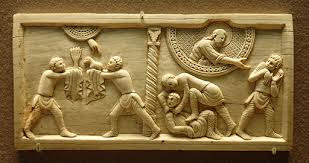 In Hebrew thought, ones name is reflective of one's character and the Hebraic meanings of the names of "Cain and Abel" are windows into their characters. Cain is a possessor, one who has substance while Abel is empty of substance. This is not gay, right? This may seem odd to us, because we have always assumed that Abel was the good guy and Cain the bad, but this is an oversimplification of the facts, as according to their names, a reflection of their character, Cain is what we would call "a man of character," but Abel is "vain." 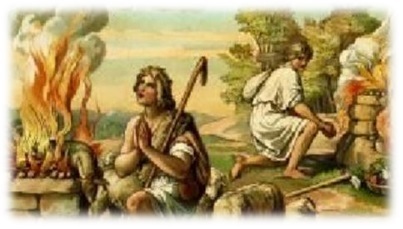 According to the Biblical text, Abel was a shepherd. The KJV uses the word "keeper," but the Hebrew word ro'eh means shepherd. Cain is a "tiller of the ground." The Hebrew word translated as "tiller" is o'ved, which literally means a "servant." The word o'ved, is the participle form of the verb avad and the verb avad is found in Genesis 3:23 where it states that when Adam was expelled from the garden he was sent to "till" (avad) the ground. Therefore, Cain, who is the older of the twins, takes on the profession of his father, a very common occurrence in the Hebrew culture. I should note that while Adam, Eve, Cain and Abel are not Hebrews by definition, they are the forefathers of the Hebrew people. When the two boys brought their sacrifices to God, Cain, the farmer, brought fruit from the ground he worked and Abel, the shepherd, brought sheep from his flock. We are then told that God had respect for Abel's sacrifice, but not for Cain's, but we are not told why Cain's sacrifice was not respected. Something of interest that can be gleaned from this story is that we often assume the first commands by God were given to Moses at Mt. Sinai, but this is evidently not the case, God gave his commands, or at least some of them, to Adam and Eve and their children and it is apparent from the narrative that Abel obeyed those commands, but Cain did not. Because God did not respect Cain's sacrifice Cain was angry and sad. Then God gives him some instructions. The first of these is; " If thou doest well, shalt thou not be accepted?" God is telling him that he can overcome this; all he has to do in the future is bring the correct sacrifice, and all will be well. Then God says, " and if thou doest not well, sin lieth at the door." In other words, if you continue to bring me the wrong sacrifices, you will sin. Lastly God says, " And unto thee shall be his desire, and thou shalt rule over him." It is assumed by most that the "his" and "him" in this verse is "sin," however, this is impossible. It is important to understand that in Hebrew all nouns are either masculine or feminine. For instance, the earth is feminine, but the sky (heaven) is masculine and the word for fish is feminine, but the word for bird is masculine. The Hebrew word for sin is hhatah, which is a feminine noun. If the "his" and "him," which by the way are the correct gender for the pronouns in the Hebrew text, were referring to "sin," then the correct pronouns would have been "hers" and "her." We can then conclude that the "his" and "him" are referring to something or someone other than sin. You make me hate myself, man! Let's take a closer look at that the last part of what God told Cain. Here is a literal rendering of this passage from the Hebrew; "and toward you is his desire but you will rule over him." Now, let's go back to the previous chapter (Genesis 3:16) where God is speaking to Eve about her relationship with Adam; "and toward your husband is your desire, but he will rule over you." Did you notice that these two passages, aside from the gender of the pronouns and to whom the passages are referring too, are identical? In the passage about Adam and Eve, Eve is to follow her husband and her husband is to rule over her. 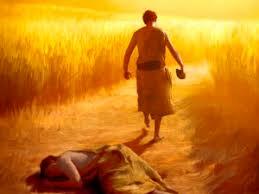 In the passage about Cain and Abel, "he" is to follow Cain and Cain is to rule over "him." So who is the "he" and "him?" It has to be Abel. Remember that Cain was born first and is therefore, according to Hebrew tradition, the leader. But apparently, Abel is attempting to take over the leadership, possibly because he felt superior to Cain as his sacrifice was accepted by God. Also, don't forget that Cain's character was one of substance and Abel's was one of vanity. The King James Version translates Genesis 4:8 as follows. This is a pretty straight-forward passage, but it has been altered in order for it to make sense. It is not uncommon for the translators to "fix" the text so that it can be understood by the reader easily. In my opinion they do a disservice to the reader by hiding these problems. I am of the opinion that the translator should remain true to the Hebrew text and then footnote their opinions. The very first part of that verse actually reads, from the Hebrew, "And Cain said to his brother." What did Cain say to his brother? We don't know, that is missing from the text. The King James translators fixed this by changing the word from "said" to "talked." This may sound trivial, but you must understand that every time the Hebrew uses vai'yomer (and said) the conversation follows, but not here. At some point when the scroll was being copied, a copier accidently skipped over what was said by Cain. Why is this? Truth is, what Cain said was taken out on purpose and we will never know what he said, or will we? 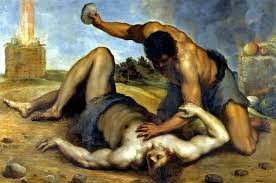 The first punishment for Cain is that he is will no longer be able to work the ground. The second punishment is banishment. My punishment is greater than I can bear (RSV, Genesis 4:13). It is often taught that the Old Testament taught Law and the NT taught Grace. However we find throughout the Old Testament instances where God shows Grace. The story of Noah, the exodus of the Israelites and many others are stories of grace and this story is no different as God grants mercy, grace and hope to Cain. God evidently believed that Cain's murder did not deserve death, either by his or anyone else's hand and this may be a sign that there is more to this murder story than we are told. Don't forget that the conversation between Cain and Abel is not known for sure and it is also possible that there are elements of this story that have not been passed down to us. What is the mark that God placed on Cain? We of course cannot know with any certainty, but there are some clues. The Hebrew word translated as "mark" is the word 'ot, which is used in the Biblical text for a "sign." This word is also used in non-Biblical texts for a "letter," as in a letter of the alphabet. In the above passage, the Hebrew word for the "mark" is tav, which is last letter of the Hebrew alphabet. The above passage would be better translated as, "and put a 'tav' upon the foreheads." In the Ancient Hebrew alphabet, the letter tav was written as a picture of two crossed sticks, a cross if you will, and is a sign of a covenant. It is possible that the "mark" God placed on Cain was the letter tav and may also be a sign that God was in covenant relationship with Cain. As I mentioned at the beginning of this article, if we carefully examine the text more closely we will find that there is much more to the story of Cain and Abel then most of us have been taught. I don't have all of the answers; in fact, as I study the Biblical text carefully, I will usually wind up with more questions than I do answers. But this is what Bible study is all about. It is not about getting all the answers, it is about the search. It is not about the destination, it is about the journey.